ravenclawwit's desktop is too pretty to ignore. The clock in the center is a combination of awesome-looking cyberpunk and a Keep Talking and Nobody Explodes challenge — but it's just the time. Here's how it's all set up. 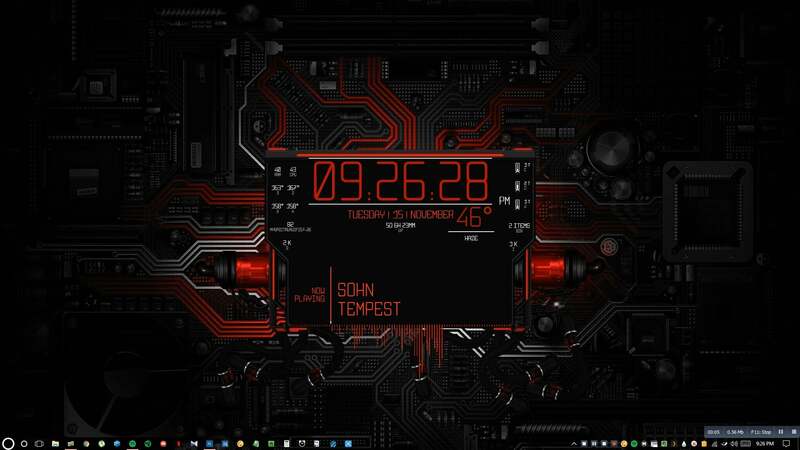 If you want a similar look, first you'll need Rainmeter, which we've highlighted before, as an easy way to bring a little personalisation and customisation to the Windows desktop. Not too many moving parts, but when they're all combined they have a really dramatic, really distinctive look. If you dig it, or if you have questions about how to make this — or a similar look — your own, hit the link below to check out ravenclawwit's Kinja post on the desktop, and ask your questions about the setup!